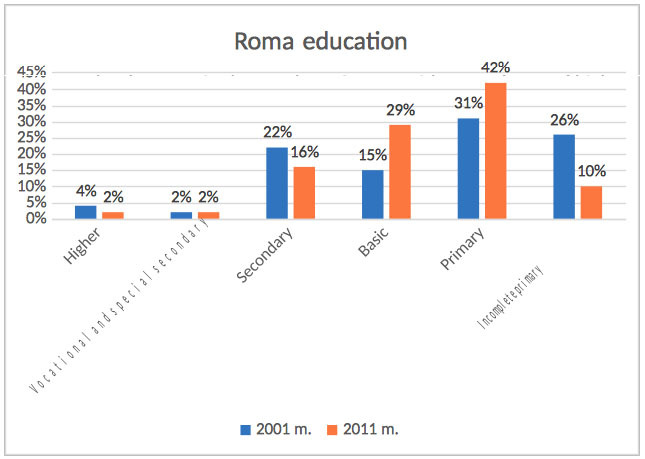 Data of population and housing census of 2001 and 2011 showed important changes in education, until 2011 the Roma education level has been constantly growing. The number of illiterate persons and persons that failed to complete primary school has decreased several times, the part of Roma with primary education has increased; also, the number of Roma with basic education kept on increasing. However, the decrease in the number of Roma with secondary and higher education has been noted. Roma children and young people attend informal education groups, take part in extra-curricular activities. According to data of 2015, 33% of Roma children attend child day care or children’s activity centers. 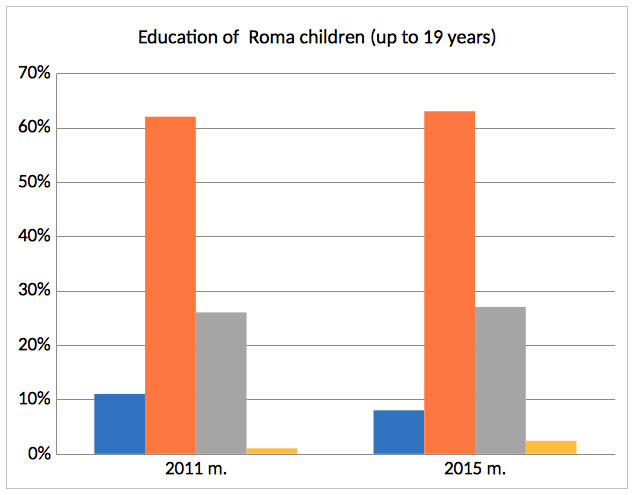 Education of Roma people in 2001-2015 has noticeably changed. Compared to data of 2001, illiteracy and incomplete primary education in this age group decreased by 39% (in 2001 –47%, in 2011 – 11%, in 2015 – 8%), the number of persons with basic education increased from 7 to 27%. In 2011, education of Roma children (10-19 years) in their peer children group in across Lithuania distinctly differed only in secondary education, while illiteracy, primary and basic education indicators differed only by 1-5% (in 2001, the difference reached 11-36%).